When Paul Singh left India to flee a land filled with corruption, he chose America to make his home, a country he admired for its freedom and justice. Decades after his arrival, his idealistic vision of our nation died while being targeted and framed by the very government he trusted. Assured by the FDA that the most widely used IUD in Europe was approved for use here, he continued using it for two years while the FDA and DOJ tracked his every move to build a case against him for using the device. Singh knew nothing about this until a team of armed agents raided his office and expelled undressed female patients from their exam rooms. 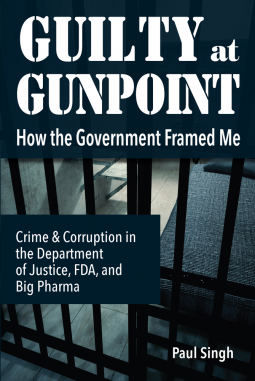 The FDA then fabricated documents, destroyed and suppressed evidence, intimidated witnesses, and coerced him into signing a plea deal by threatening to imprison his wife, as well, giving him two hours to sign it…or else. Singh has since learned how widespread corruption in our criminal justice system is, with prosecutors who will lie and incarcerate innocent citizens without due process, to further their careers. Singh cites various statutes, case laws and books by top-level insiders to prove how laws were broken by corrupt prosecutors. He shows how our vision of America based on ideals of our founding fathers, and the reality of American justice are no longer aligned. Guilty at Gunpoint with its companion guide book, The Death of the Rule of Law should be required reading for every law student and anyone interested in the way justice is administered in the United States. Une histoire vraie, incroyable! Paul Singh fournit des pièces à conviction irréfutables pour prouver ses affirmations et cite lois et ouvrages pour montrer comment les lois ont été violées par des procureurs corrompus dont le seul objectif était de faire avancer leur carrière. Un page turner glaçant que vous ne pourrez pas lâcher ! Lecture en anglais dans le texte, à réserver pour des lecteurs aguerris.